Ethanol vehicles may have worse effects on human health than conventional petrol, US scientists have warned. A computer model set up to simulate air quality in 2020 found that in some areas ozone levels would increase if all cars were run on bioethanol. Deaths from respiratory problems and asthma attacks would increase with such levels, the researchers reported in Environmental Science and Technology. The EU has agreed that biofuels should be used in 10% of transport by 2020. Mark Jacobson, an atmospheric scientist at Stanford University in California, used a computer model which took into account factors such as temperatures, sunlight, clouds and rain to simulate air quality in 2020 for two different scenarios. In one simulation all vehicles were fuelled by petrol and in the other all vehicles were fuelled by E85 - a mix of 85% ethanol and 15% petrol. If all cars were run on E85, he found that in some parts of the US there were significant increases in ozone - a pollutant with harmful effects on the human respiratory system - compared with petrol cars. In the study, the increase in smog translated to an extra 200 deaths per year in the whole of the US, with 120 occurring in Los Angeles alone. Increases in ozone in some areas of the US would be offset by decreases in other areas but overall there would be 770 additional visits to accident and emergency and 990 additional hospitalisations for asthma and other respiratory problems, the results showed. Although ethanol was found to reduce levels of two atmospheric carcinogens, levels of others increased so associated cancers would be the same as with pollution caused by petrol fumes, the study showed. "We found that using E85 will cause at least as much health damage as gasoline, which already causes about 10,000 premature deaths annually from ozone and particulate matter," said Jacobson. "The question is, if we're not getting any health benefits, then why continue to promote ethanol and other biofuels." He added: "By comparison, converting all vehicles to battery-electric, where the electricity is from wind energy would eliminate 10,000 air pollution deaths per year and 98% of carbon emissions from vehicles." In principle, biofuels - ethanol and diesel, made from crops including corn, sugarcane and rapeseed - are a way of reducing greenhouse gas emissions compared to conventional transport fuels. Although they produce carbon dioxide, growing the plants absorbs a comparable amount of the gas from the atmosphere. A government report said that biofuels could reduce emissions by 50-60% compared to fossil fuels. 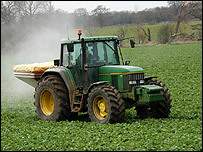 Stuart Shales, senior lecturer in environmental biotechnology at the University of the West England, said there were companies in the UK producing biofuel but that the UK was lagging behind other countries. He added that it would not be feasible for all cars to run on ethanol because too much land would be needed to grow the crops. "What people are looking at are second generation fuels which will be produced from whole biomass, like wood, which can be broken down to fermentable sugars." "This is the first time I've seen any research about ozone. "The question I would ask is, has there been any respiratory problems in Brazil where ethanol has been used since the early 1970s."